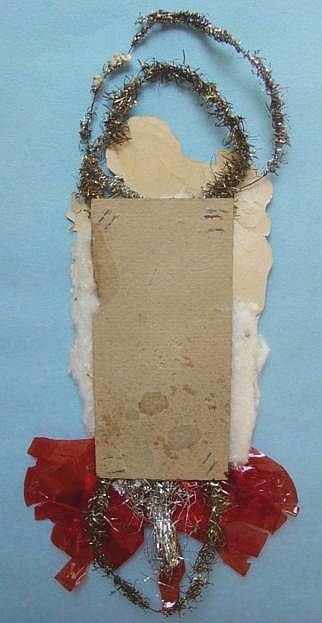 A charming, early, nicely embossed scrap of Santa in a long red coat with brown fur trim. 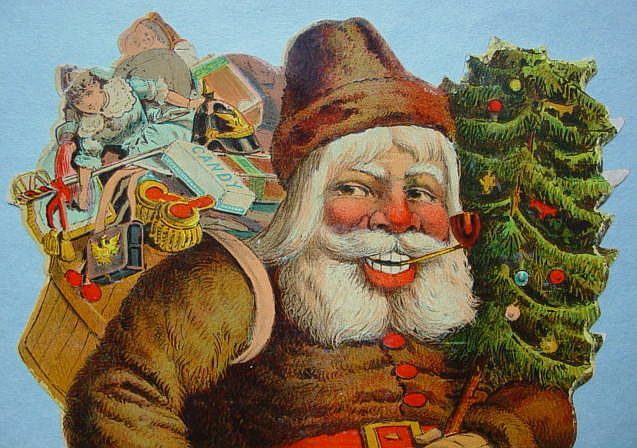 He sports a bushy long beard and mustache and carries a load of toys and a tree. 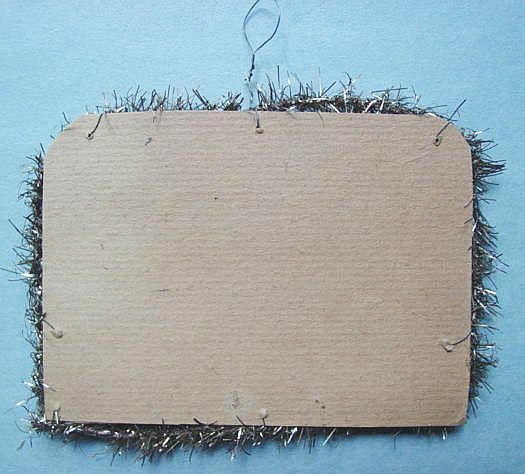 A small piece of the tree is missing on the top left side, as well as the lower left corner of the scrap. 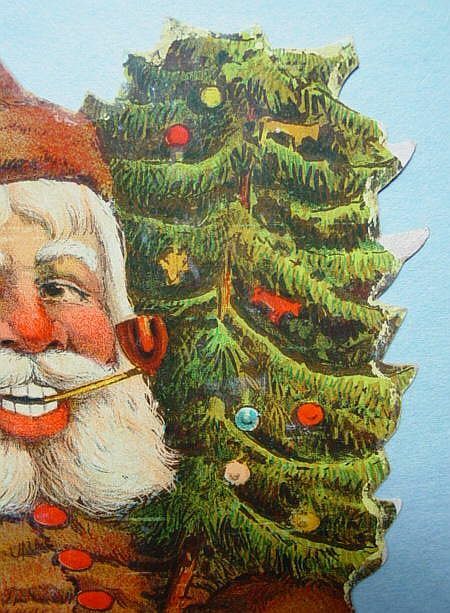 His right arm is also missing from the elbow. 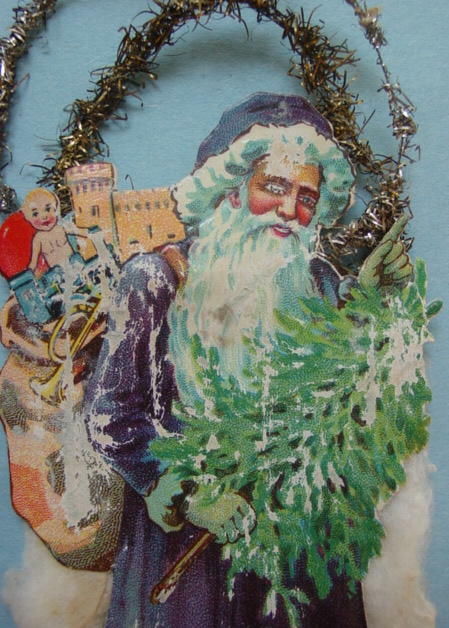 Tinsel trim adorns the ornament. 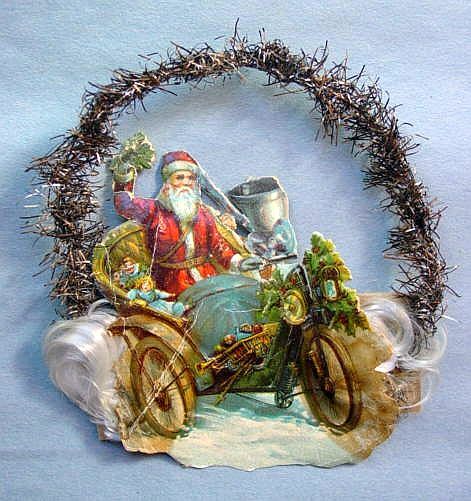 A very, nice Victorian ornament. Additional photos are attached by the link at the right. 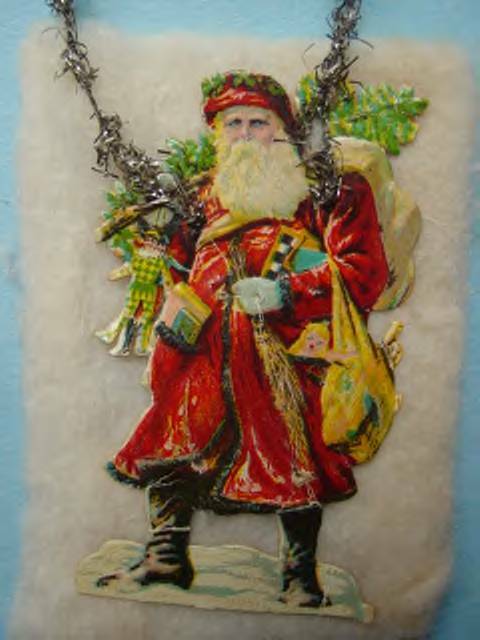 A great embossed scrap of santa in a long red coat carrying trees and toys. 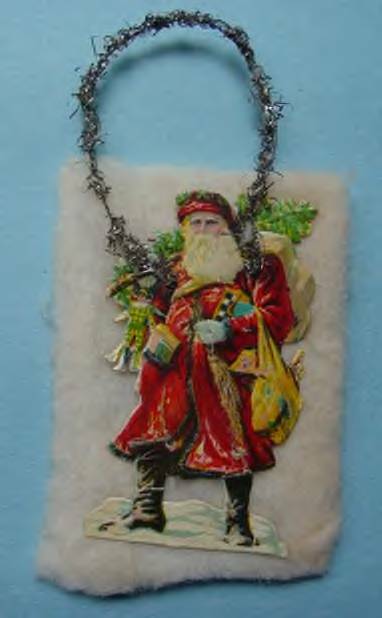 He is mounted on a cotton batting rectangle and has a silver tinsel hanger. In excellent condition. Additional photos are attached by the link at the right. 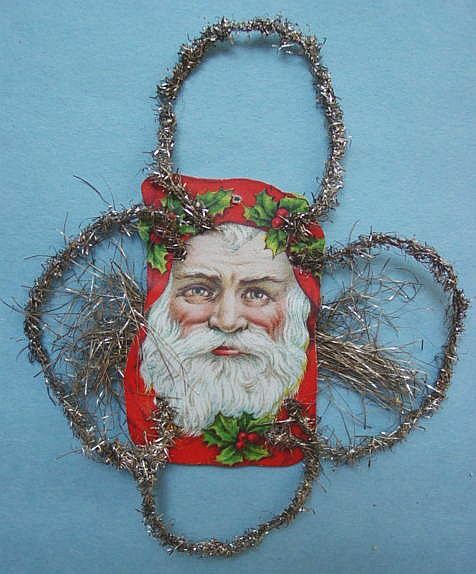 This is a lovely, early embossed Santa head scrap with thick gold tinsel loops. In excellent condition. Additional photos are attached by the link at the right. 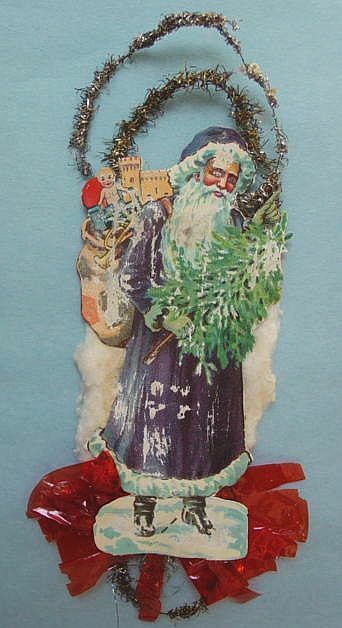 An early, lightly embossed ornament of Santa in a rare purple coat holding a tree and a bag full of toys. 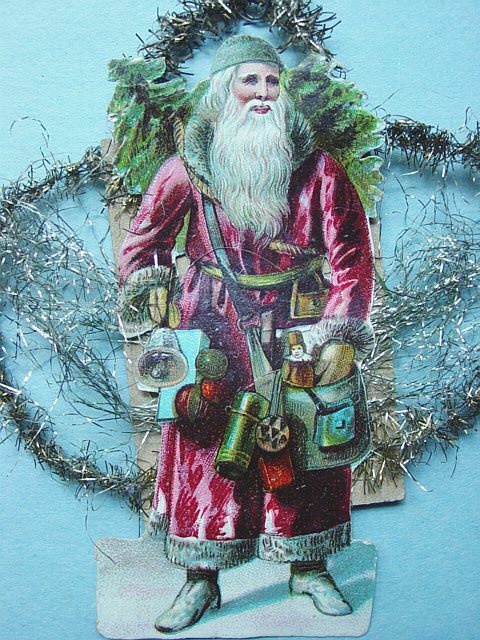 Adorned with cotton batting, double tinsel handles, tinsel spray and red gel cellophane. 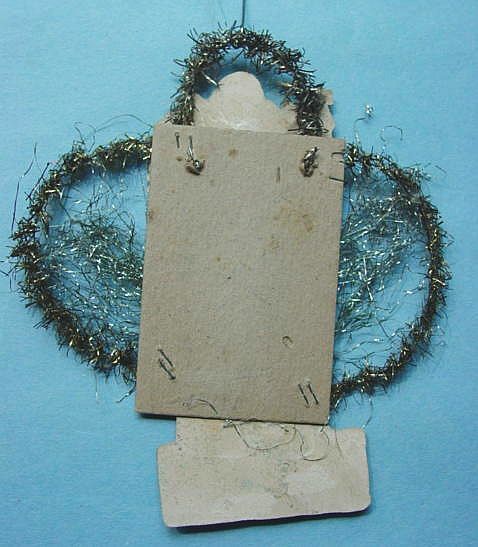 The scrap does have some worn areas on his coat, face, toys and tree. But, overall this is a fantastic collectible piece! Additional photos are attached by the link at the right. 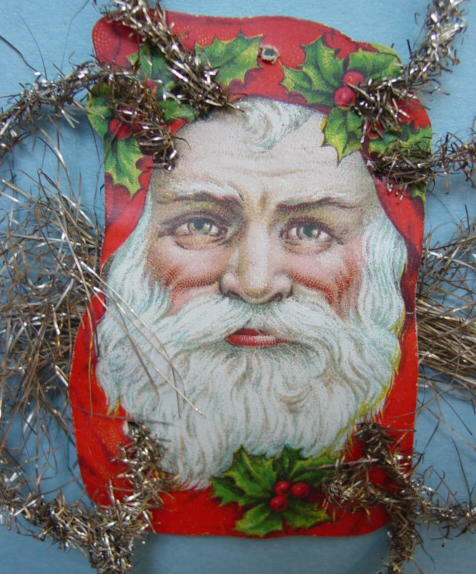 A wonderful unembossed Santa head scrap in a tinsel clover with a tinsel spray on each side. In excellent condition. Additional photos are attached by the link at the right. 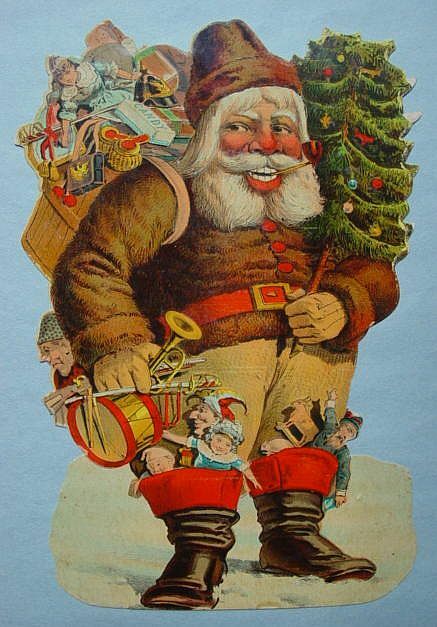 A wonderful embossed Santa in a rare pink coat carrying a load of toys. 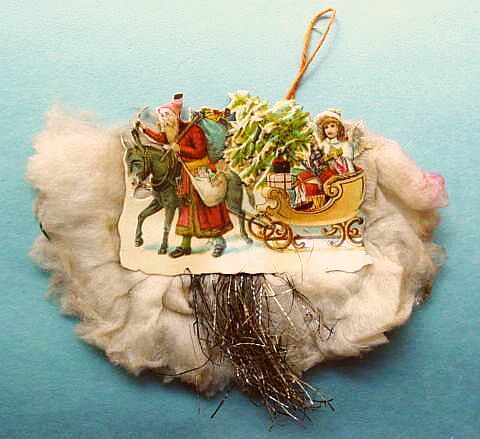 In a tinsel clover with a tinsel spray and in excellent condition. Additional photos are attached by the link at the right. 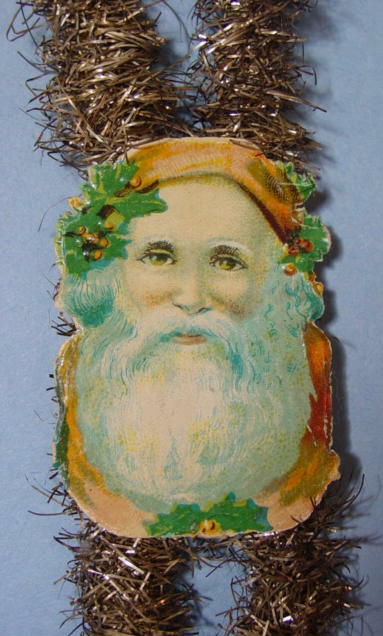 A great Victorian Santa die-cut on heavy cardstock. Colors are clear and bright. 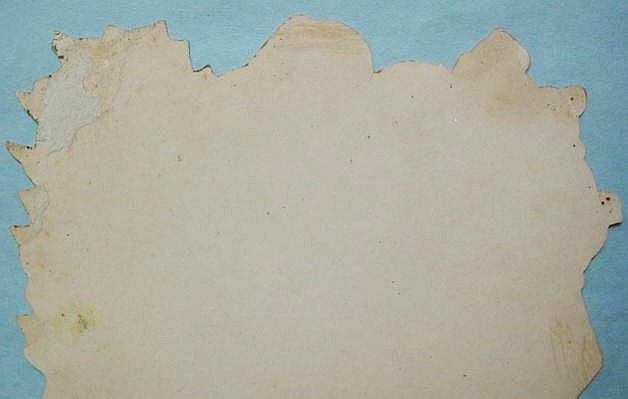 There is paper missing on two tips of the tree branches and minor edge wear in that area. 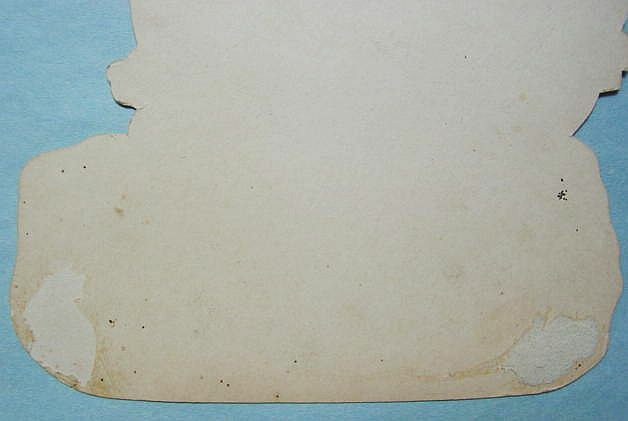 It appears that the die-cut might have been in a scrapbook at one time because there are remains of paper and glue on the reverse side. It does not affect the front. 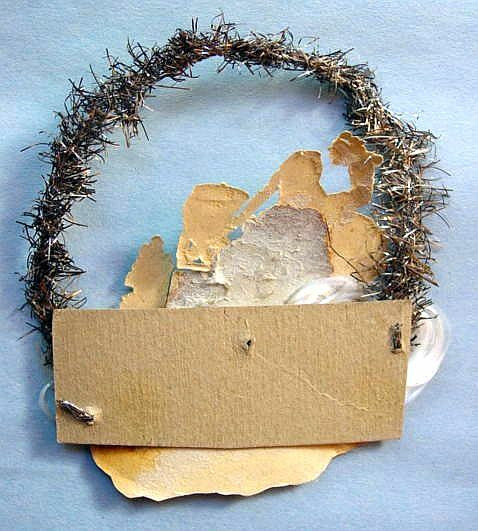 A fabulous piece and an asset to any collection. Additional photos are attached by the link at the right. 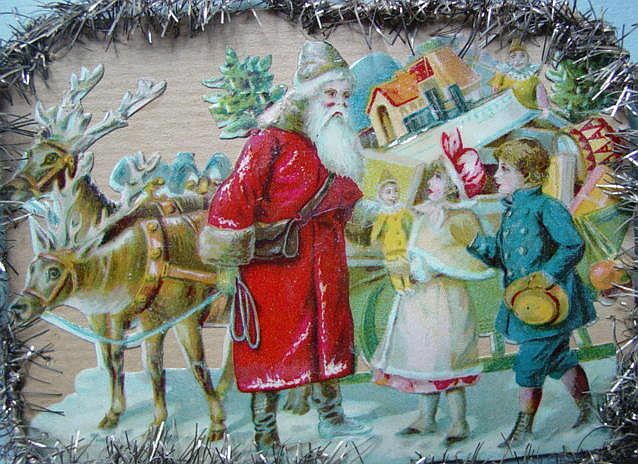 A wonderful embossed scrap of Santa with two reindeer and a sleigh loaded with toys. 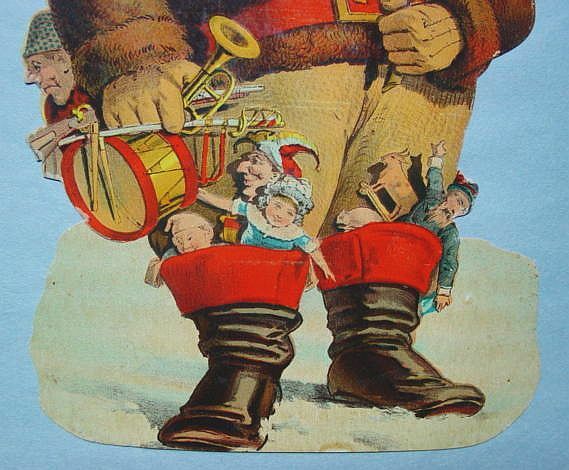 A Victorian boy and girl are there to greet him. 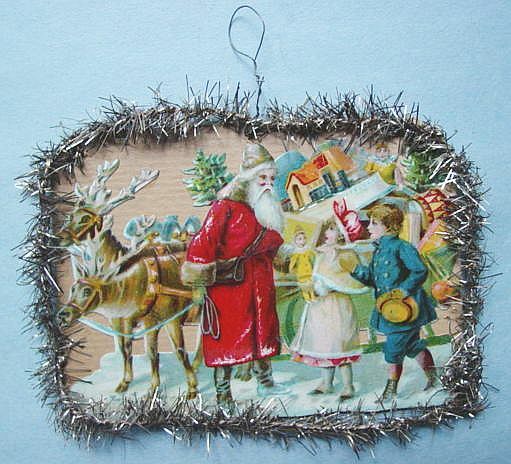 Mounted on cardboard and edged with tinsel. 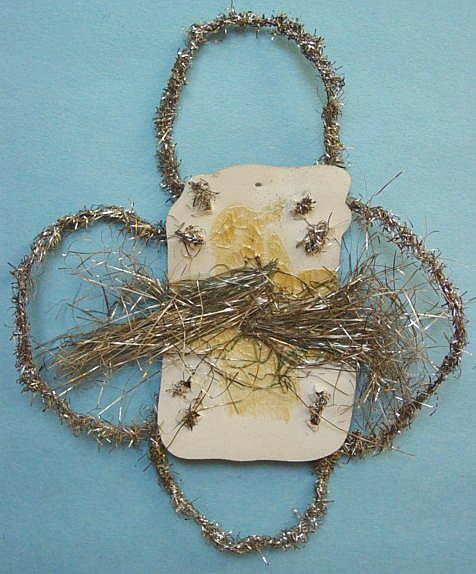 A thin wire is the hanger. In excellent condition. Additional photos are attached by the link at the right. 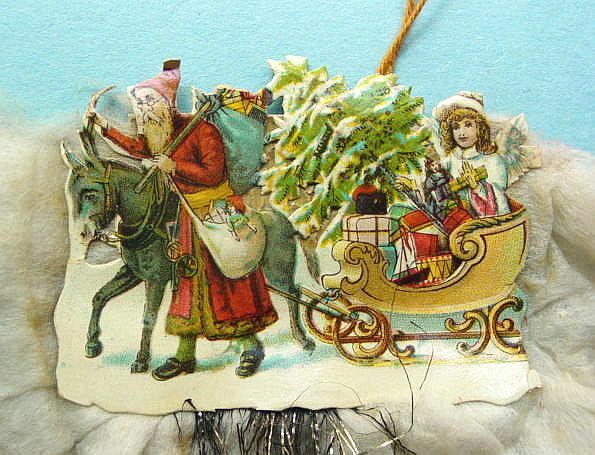 A great Victorian ornament with an embossed scrap of Santa (wearing glasses) with a horse drawn sleigh filled with toys, tree and a little girl. 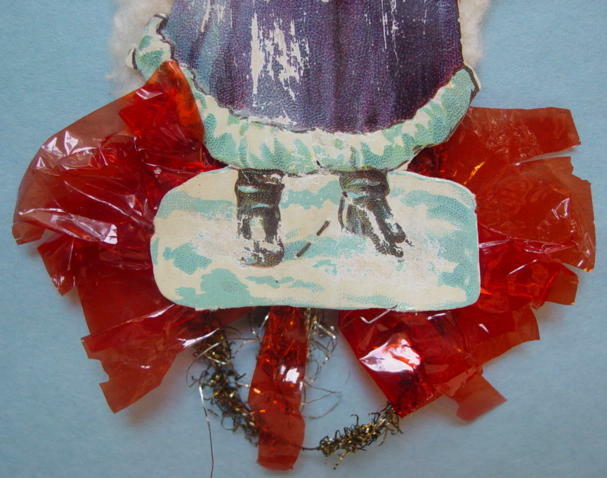 Mounted on a cotton skirt or puff with a tinsel lametta spray. 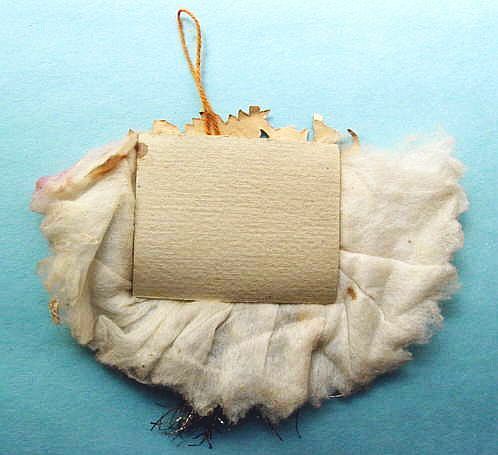 It retains its original string hanger. In excellent condition. Additional photos are attached by the link at the right. 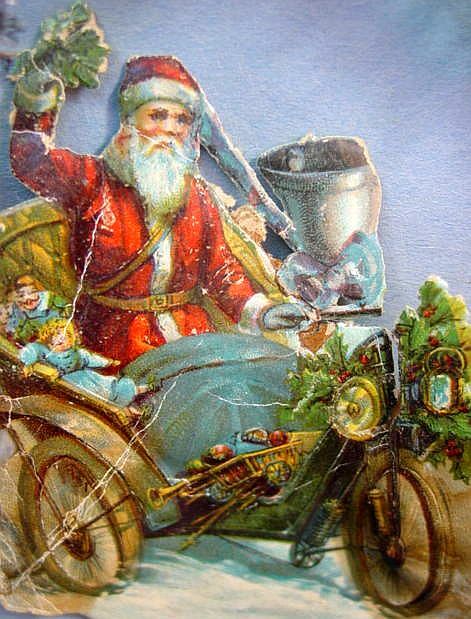 A great image of Santa driving a car filled with toys. 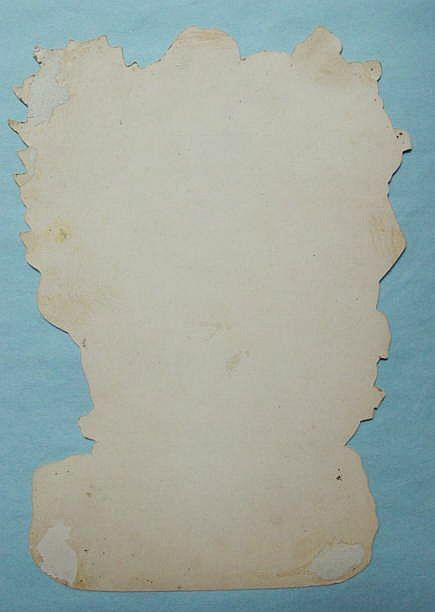 The embossed scrap has a few little creases but they do not detract from the charm. 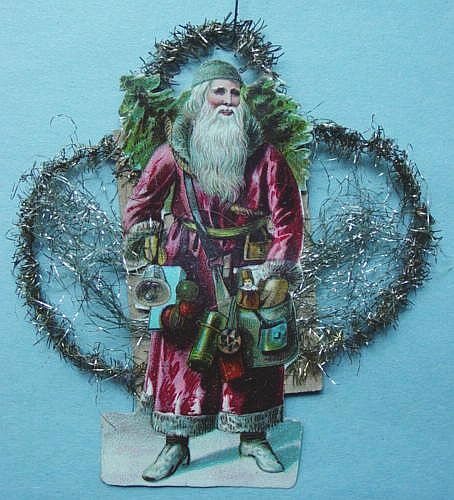 It is also decorated with spun glass angel hair curls and has a tinsel handle. Overall, in excellent condition. Additional photos are attached by the link at the right.